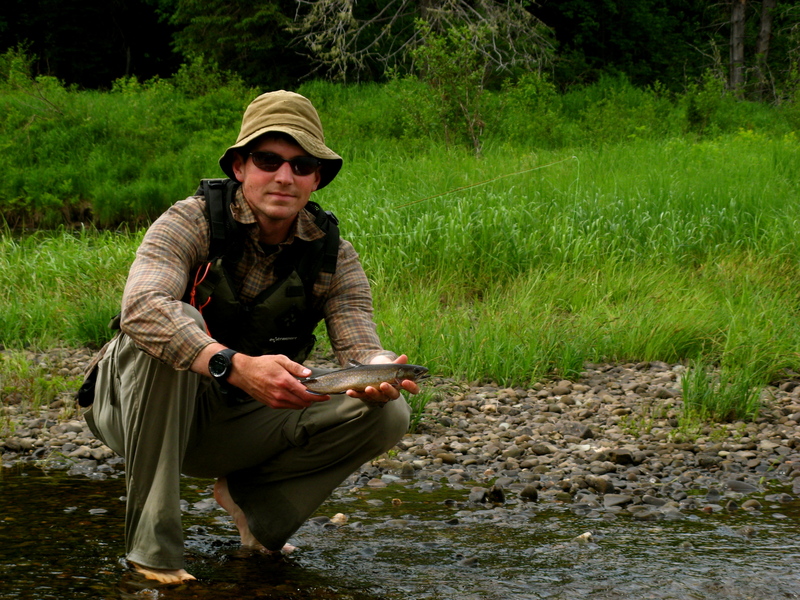 I can count the number of times I have been fly fishing in my life on one hand and if you were to cut off both of my hands it would not hinder me from showing you how many fish I have caught on the fly. 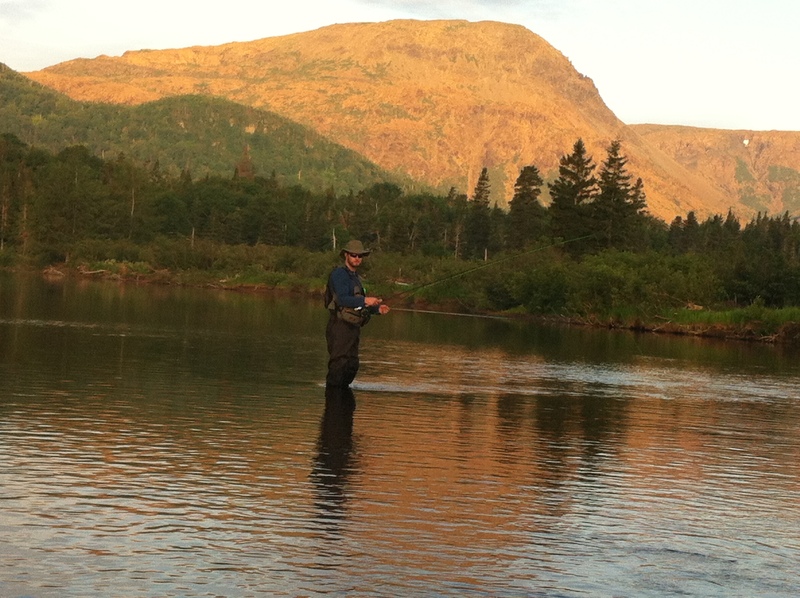 So when an amateur like me is approached by a co-worker with an opportunity to go fishing on one of western Newfoundland’s most prolific salmon rivers, I only asked when we were leaving and how many days of vacation to take. 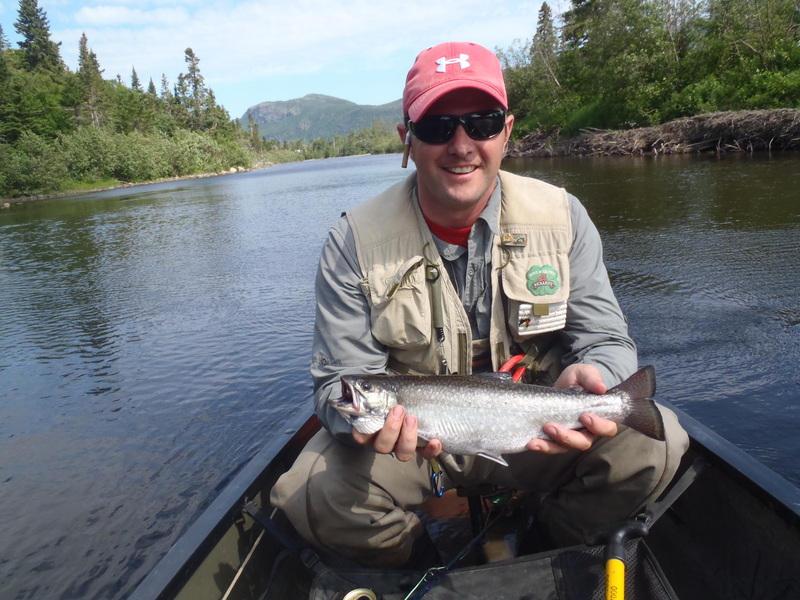 We were heading to the Serpentine River, which is nestled between two of Newfoundland’s highest ranges, Lewis Hills and Blow-Me-Down Mountains. The river flows out of Serpentine Lake to the north-west through a series of deep holes, rapids, and falls before finally reaching the Atlantic Ocean. Most access the river via a 55km logging trail — that is long overdue for some routine maintenance. 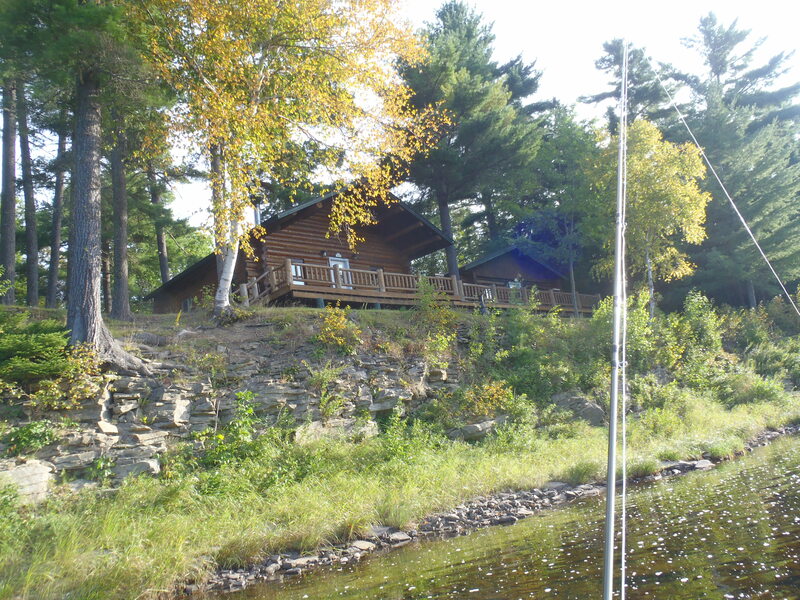 The trail arrives at the south end of the lake, after which a 10-minute boat ride will bring you to the river source. We loaded all of our gear into our transportation for the next two days — an Old Town “Labrador” Predator equipped with a 4HP Yamaha outboard — and set out across the lake. After navigating through the shallow opening, and around a couple sweeping turns we arrived at base camp. We set up our tent, enjoyed a couple footlong subs, and set about rigging up our rods so we could get in a few casts before sundown. As we idled down the river we gazed into the pools to see if we could see any fish. 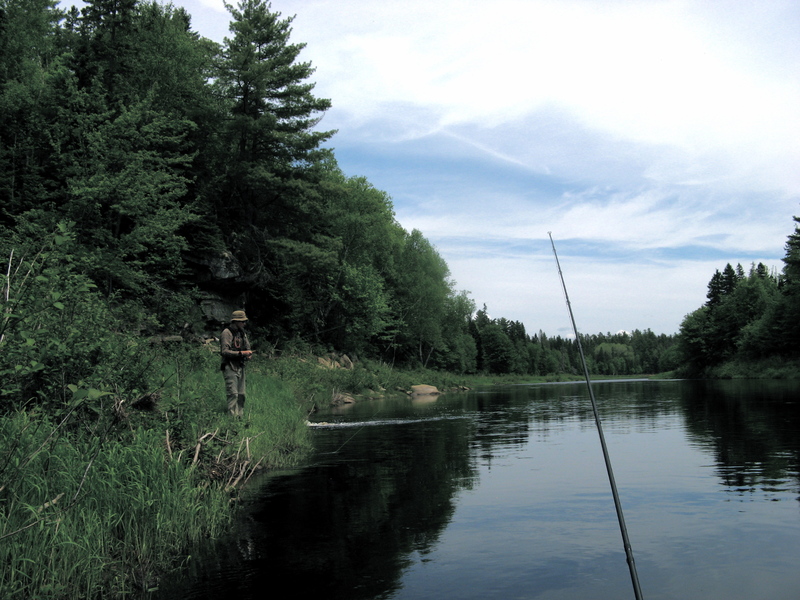 There were plenty of good-sized trout – the kind I dreamed about back in New Brunswick — but didn’t see anything resembling a salmon. We opted to pass through one of the larger pools — called Dark Hole — to try our luck on Governor’s Rock, around the next bend. Governor’s Rock is a deep pool on an outside bend of the river; it features a large rock in the middle. The pool is too deep to stand in, and it is lined with mature trees making fishing from a boat the only viable way to fish it. We positioned ourselves above the rock and set anchor. My coworker Cory fished from the stern while I from the bow. 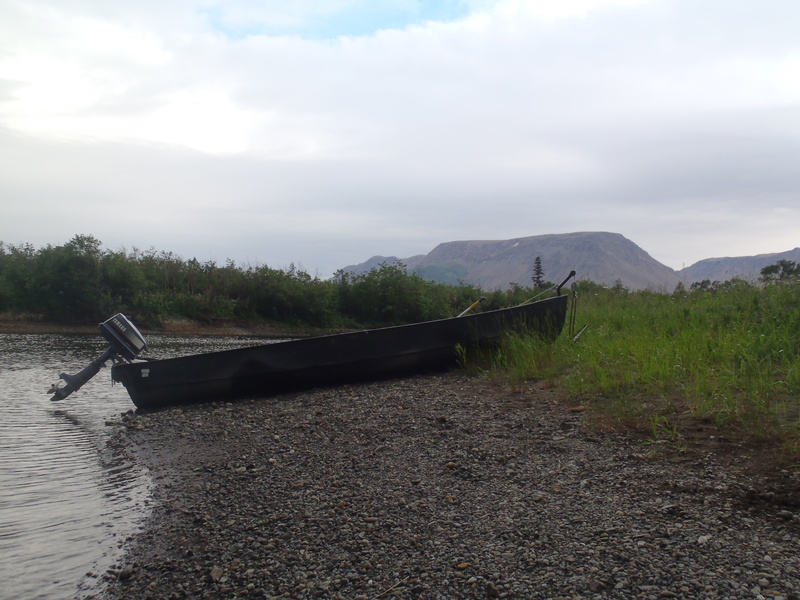 The wind was moving the boat back and forth, giving us both ample opportunities to land a few casts in the slow moving water behind the rock. 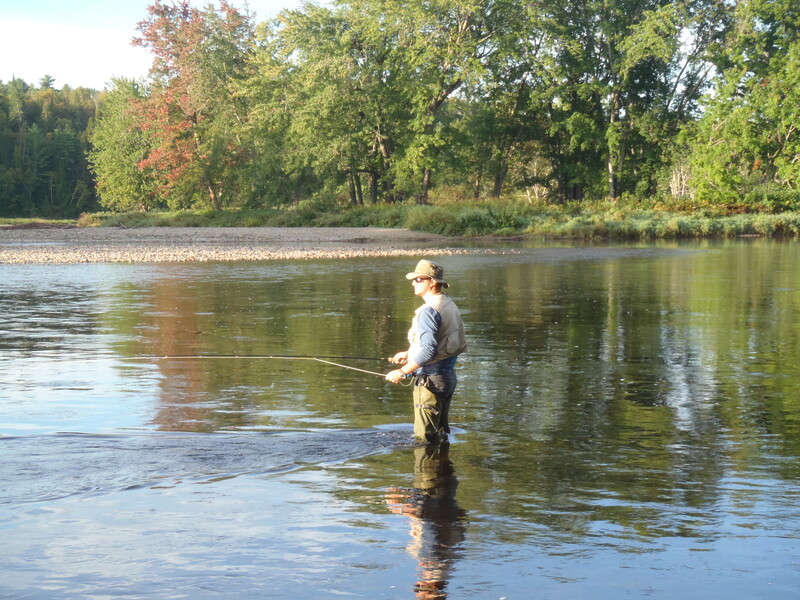 As I stated earlier I have not fly fished many times in my life, hence I was having a hard time casting from the boat with another person less than 8 feet from me. This difficulty became apparent to Cory, when I whipped him in the face on a back cast! As luck would have it — as I was apologizing to him while surveying for damage — the reel screamed…. ZINNNGGG! Fish on! I pulled the rod tip skyward in an effort to set the hook and I was amazed to see a magnificent salmon breech the water and soar through the air landing back in the water behind the boat with a large splash. I kept the rod high in the air and began reeling. I was constantly asking Cory for guidance, as I had no idea how fast I should retrieve my line. There are numerous obstacles when fishing from a boat, all of which found their way into my path of retrieval. I had a close encounter with the anchor rope at one end and the motor at the other. The fish made a dive under the boat and the reel began screaming again. I battled him as he emerged down river from us as Cory picked up the net. He had me bring the fish to the starboard side and begin reeling hard. You could see the fish was tiring as he was beginning to roll on his side. 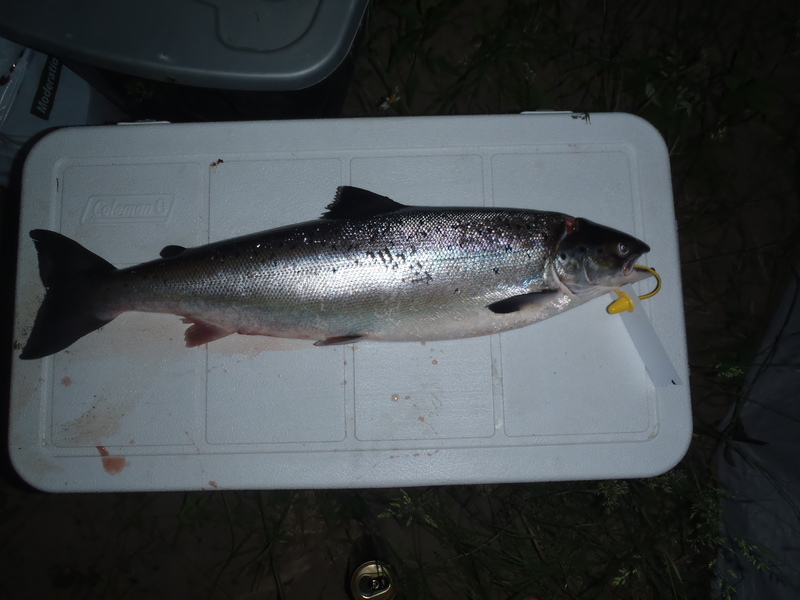 It was merely a net scoop away from being my first Atlantic Salmon. Cory didn’t fail me. After a 5 minute clash, there between my knees in the boat was a 4.2lb, 61cm grilse. I grabbed it by the gills and tail and held it proudly for the camera. What an exciting feeling to be holding that fish! I promptly tagged it and told Cory to shut off the camera and get his line back in the water! My 4.2lb baby boy! Catch of a lifetime! That evening Cory and I relived the catch of the day as we shared a cold beer and watched as our fire flickered on the dark banks of the Serpentine. The night sky sparkled with thousands of stars and the promise of great day again tomorrow. We settled into our respective sleeping bags with dreams of Salmo salar dancing across the water in our heads. 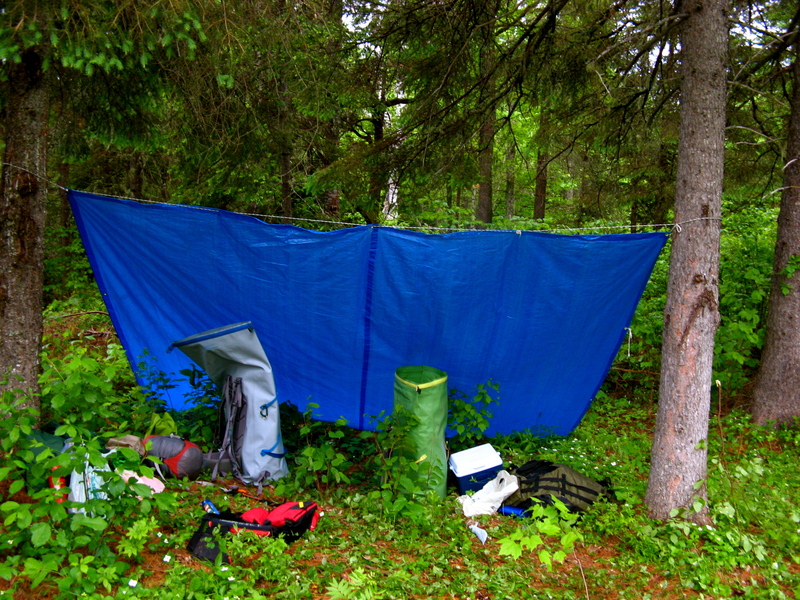 The next morning as the sun poked over the hills, a granola bar made its way into my gut as I slipped into my waders. It was 5:20 and we couldn’t wait to hit the water. We slid offshore and gracefully paddled down around the bend. The plan for the morning was to fish the Black Hole we had passed over twice the day before and then make our way down river until hunger pains brought us back to camp for some bacon and eggs. We beached the boat above Black Hole and prepared our rods. We had some luck on None of your Business, a green bodied fly wrapped with a silver line and sporting a sparkling tail — so we both tied one on for this morning. 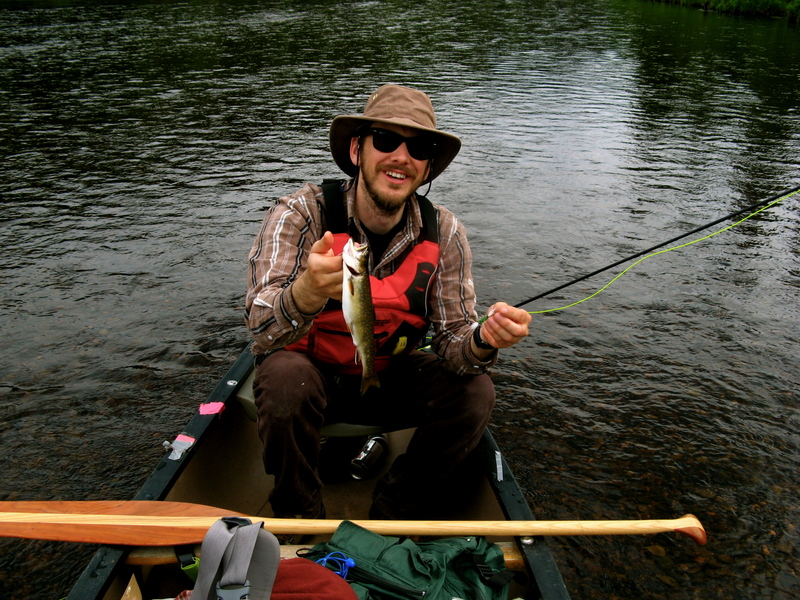 I was accustomed to using the fisherman’s knot to tie on my lures, however Cory showed me how to use an additional half hitch that not only makes your knot stronger, but also assists in presenting the fly in a different manner. We both started making our way down through the pool casting as we went. 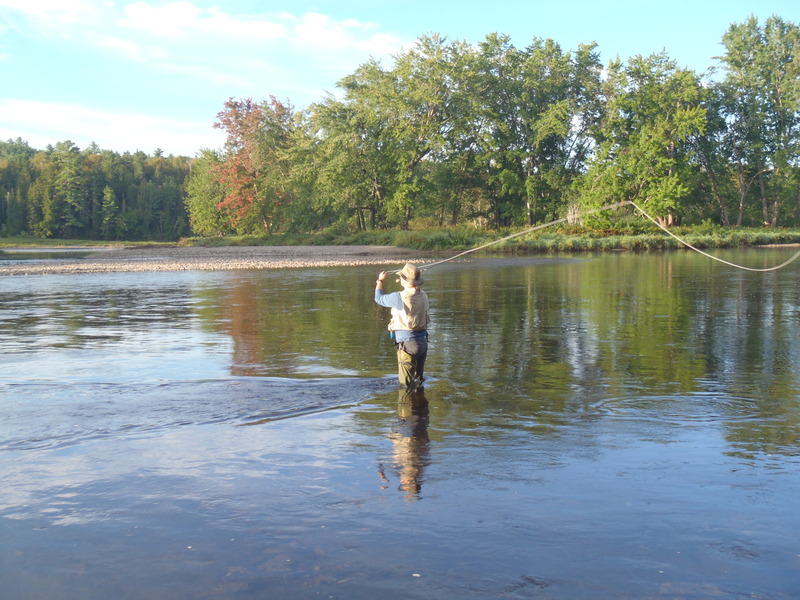 As I neared a small eddy on the far side of the river I positioned myself for a 40-foot cast into the small ripple running past. I tried to land my cast on the eddy side of the ripple so my fly would be pulled down through where I figured the salmon would hang up. 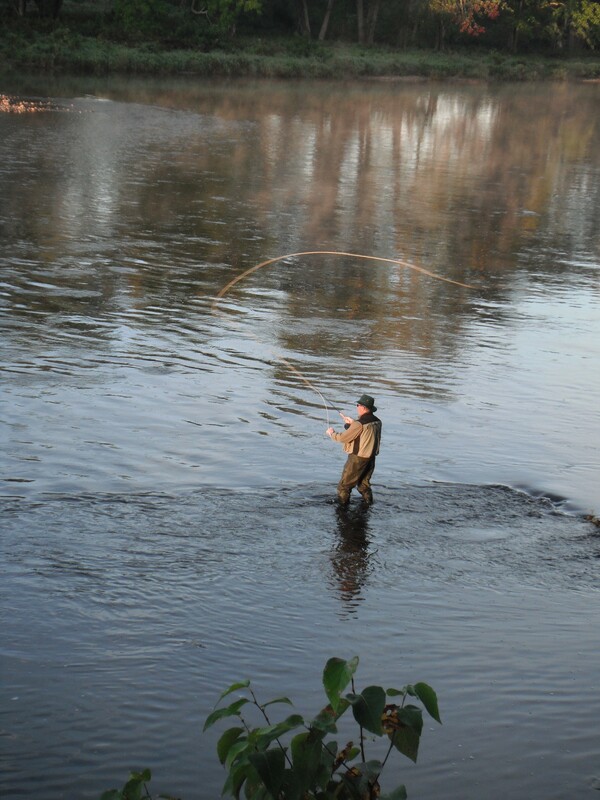 I worked the line up off the river back behind me pausing ever so slightly before whipping forward and lowering the rod tip parallel to the water. I watched as my floating line uncoiled slowly followed by my leader and dropping my fly lightly into the pool. My fly glistened as it drifted slowly in the current. 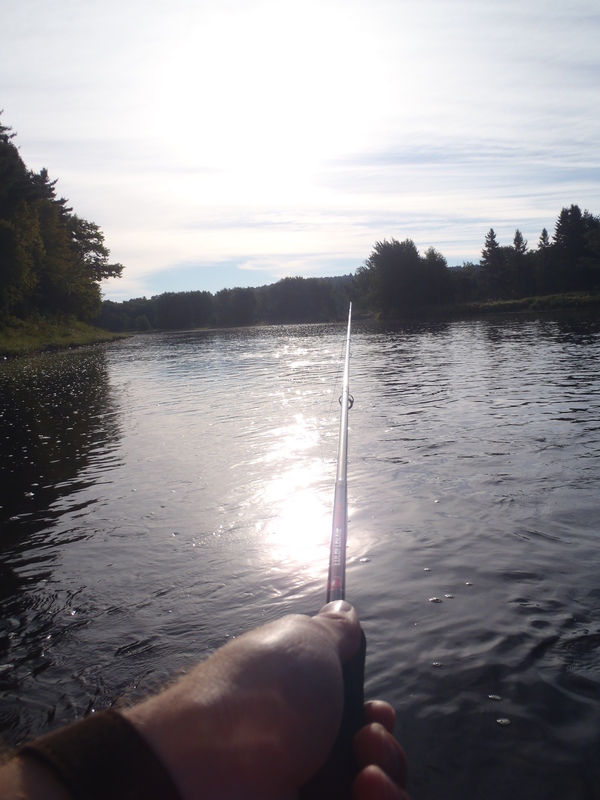 I was just thinking about pulling my rod tip skyward for another cast when ZINNGGGG…. I was into my second salmon in two days! I jerked the rod as high as I could and the reel screamed in discontent. The fish bounded skyward and hopped across the water on its side. I began reeling and making my way towards shore. Cory grabbed the net from the boat and began making his way towards me. We were both hopeful that this would be the second fish of our trip. 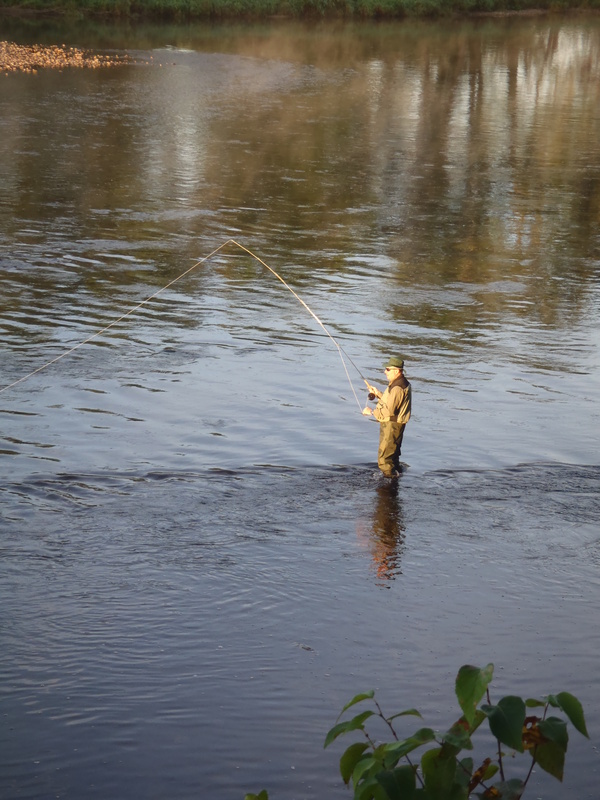 I maintained pressure on the line and watched as the fish darted down river. Cory ducked under my rod with camera rolling as the fish made a turn into the current. 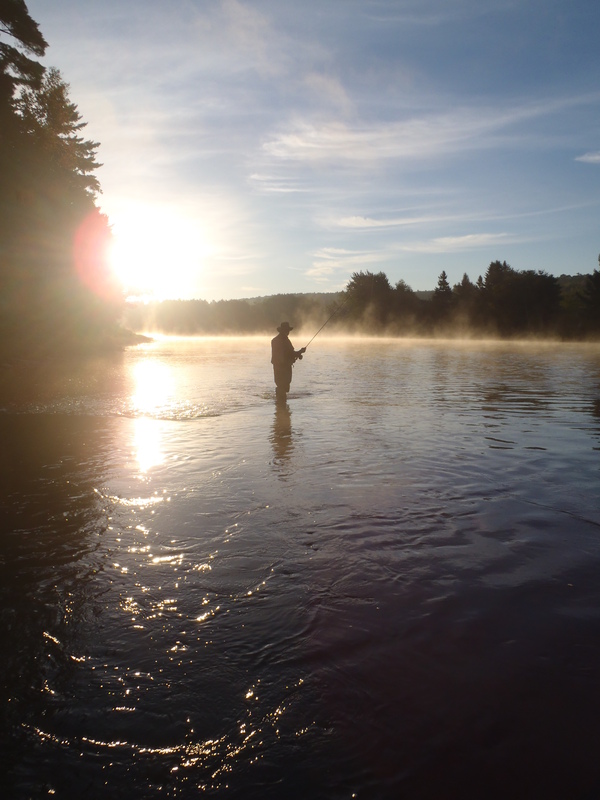 I continued to reel as the salmon muscled its way up river against the current and against the drag of my reel. Both Cory and I looked on as my line came back at me like a spring and coiled up around my feet. The morning calmness of the Serpentine valley was interrupted with a few four letter words and a faint childish giggle from a man now hooked on fly fishing! 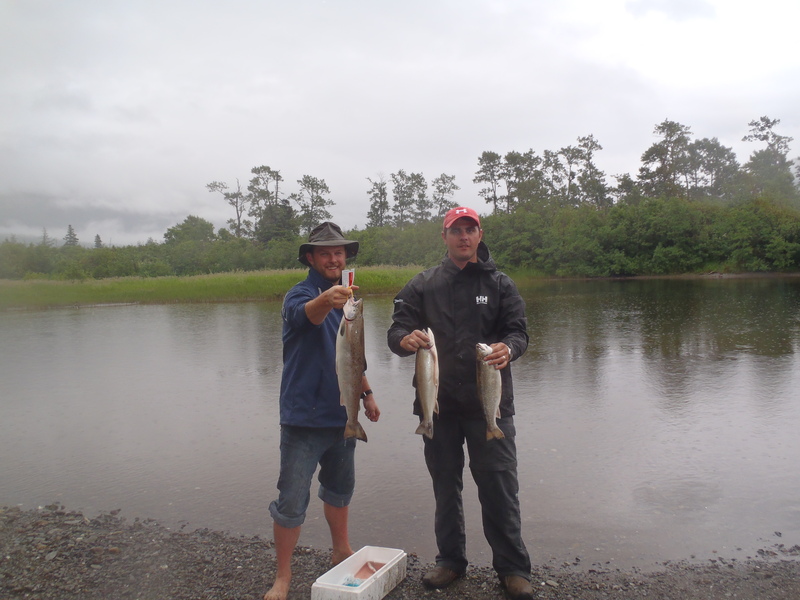 We rounded out our trip that afternoon with two beautiful sea trout, which tipped the scales at 2.4 and 1.8 pounds. The evening brought us some company on the river, and already content with our trip we allowed our friends to go fishing without us. 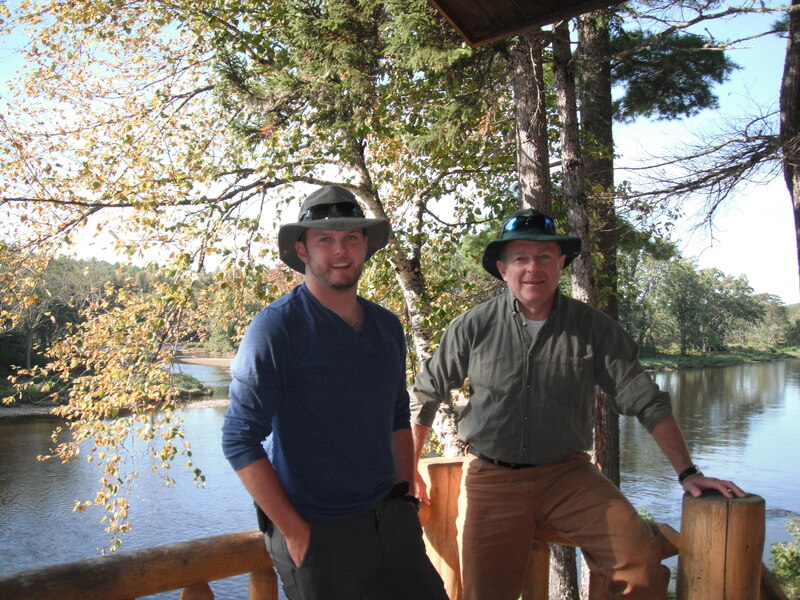 We stayed by the fire and eagerly discussed our next trip to the Serpentine River.